These New Puritans - Inside The Rose. Vinyl LP. Bleep. One of the most eagerly anticipated British albums of the year - nay, of the last five years - is finally here. People have been dying to hear more from These New Puritans ever since 2013’s Field Of Reeds, but the band have kept their cards close to their chest in the intervening years. Now they break their silence with Inside The Rose, an LP that is perhaps the band’s most comprehensive body of work yet. 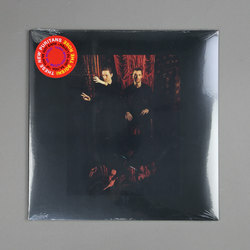 All of These New Puritans’ previous sonic output comes to bear on this record. The artsy post-punk of Beat Pyramid, Hidden’s chamber-dance style and the avant-garde compositions of Field Of Reeds all exert an influence here. Fragile, tender tracks like ‘Anti-Gravity’ and ‘Where The Trees Are On Fire’ are reminiscent of Talk Talk.